We support maryland watermen & farmers. Supporting Maryland waters and agriculture not only helps our locals, but it ensures an exceptional, fresh product that we are able to offer to you. Our base menu is available year round. However, certain items are locally sourced from our native Maryland water men and farmers. Below is a description of seasonal items that are only available during certain times of the year. Crab picking and beer drinking with your favorite people is a Maryland summer tradition. Recreational & Commercial crabbing for the Chesapeake Bay and its tidal tributaries generally begins to show promise in the month of May and runs until November. Our crabs are fresh and local; steamed and covered with our own special blend of J.O Seasoning. We sell them by the dozen or half dozen and pricing depends on the size. Stoney Creek Inn does not reserve crabs, it is first come first serve. Soft crabs are available June through October, and they are awesome. The softies are also super fresh and local, prepped to order. We start getting local produce in July: corn on the cob, vine ripe tomatoes, zucchini, squash, broccoli, seedless watermelons and peaches are a few great examples of Maryland agriculture that we are able to provide through the growing season. These seasonal items allow us to feature specialty vegetables of the day as well as some healthy and delightful entree specials. Oysters and Rockfish are a couple featured favorite items through the year. Rockfish is considered by many to be the premier sport and commercial species on the Bay. The silver-flanked, irridescent-striped rockfish is a challenge to catch and a delight to eat. We prepare them broiledor stuffed with a 6oz crab cake and topped with our homemade imperial sauce. The eastern oyster is one of the most iconic species in the Chesapeake Bay. 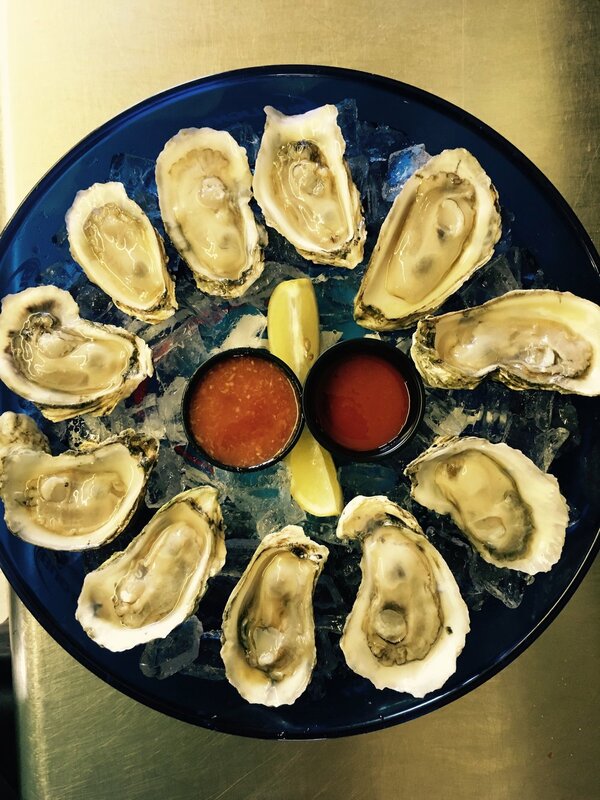 For more than a century, oysters have made up one of the region’s most valuable commercial fisheries, and the filter-feeder continues to clean our waters and offer food and habitat to other animals, and they are delicious.